Whether or not you have jumped on the “insta” bandwagon, it’s undeniable that the social platform has become one of the most popular ways to share photos and videos. Since being introduced in 2010, Instagram has grown exponentially and currently hosts over 200 million active users worldwide. As the platform has grown, it’s no surprise that top brands and organizations have incorporated Instagram into their overarching social strategies. It’s a great opportunity to drive engagement through the simple act of sharing visual content. And since Instagram is a mobile-application, it is an opportunity to interact with the ever-increasing percentage of people using mobile devices to access the Internet. 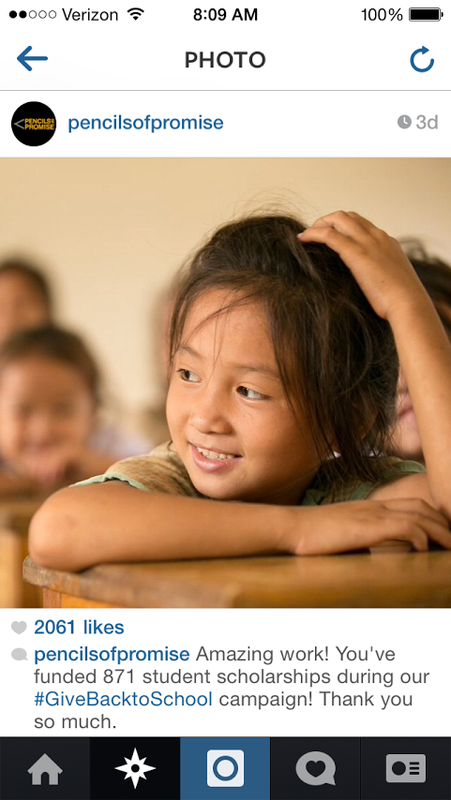 In the past, we have highlighted a few nonprofits who have a great Gram game. However, using the platform to support a specific initiative requires a campaign strategy. So today, let’s take a look at three nonprofits, who happen to be #ClassyClients, that are effectively using Instagram to interact with supporters and drive their recent fundraising efforts. Pencils of Promise just wrapped up their Back to School Campaign, a fundraising initiative aimed at raising enough money to give 1,600 students the resources needed to attend school for a year. 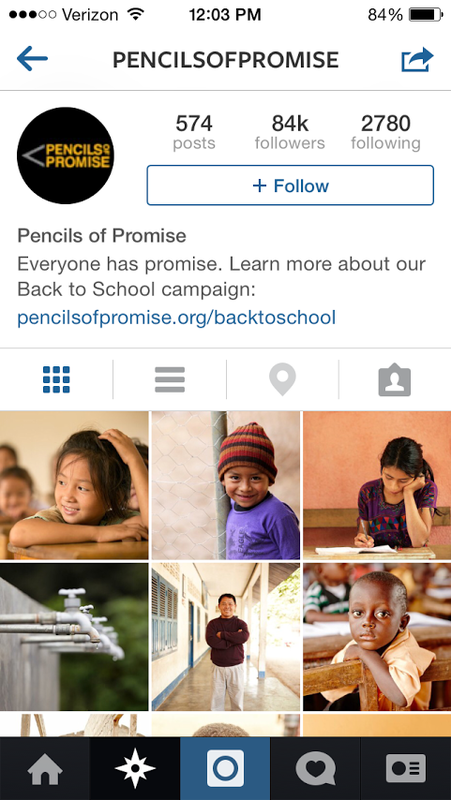 Here are a few effective ways Pencils of Promise used Instagram to engage and communicate with their supporters throughout the campaign. Instagram, like Twitter, doesn’t give users a lot of real estate to describe their profile. Instagram allows you to share a link to your respective website, along with 150 characters to describe your brand, business, or personal page. Nonprofits typically use this area to share their mission statement and link back to their respective websites. 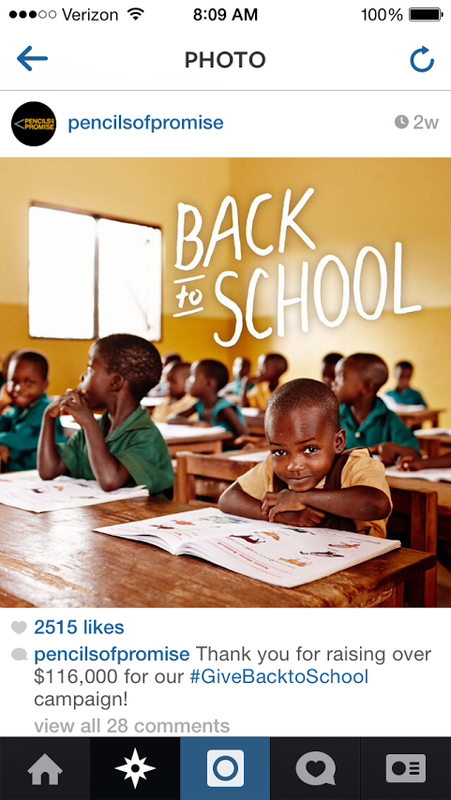 However, when POP launched their Back to School campaign they took advantage of the space. Here you can see that POP swapped out their traditional profile bio and updated it with information about their current campaign. Having this strong call to action front and center on your profile, is a great way to spark interest among your followers and start driving traffic back to your campaign page. To keep their followers engaged throughout the campaign, POP shared photos that tied back to the campaign’s overall progress. In this photo, they applauded their donors for their contributions and shared the number of student scholarships funded thus far. 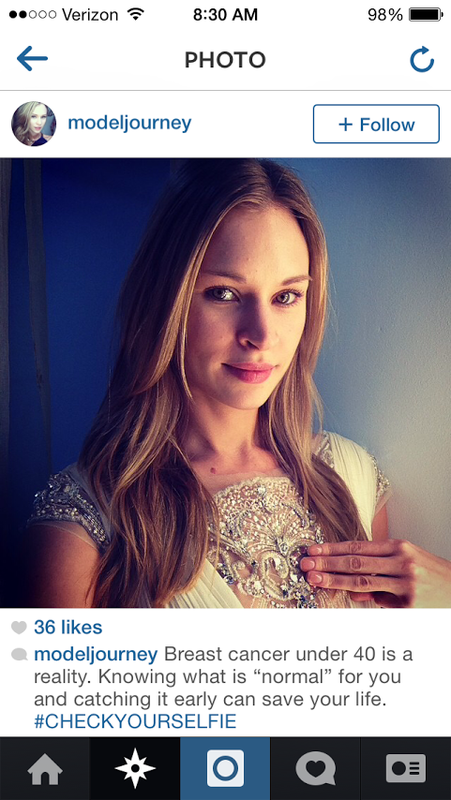 Instagram is a great platform to share impact and success because images can be incredibly moving. It is easy to relate with a photograph of a little girl at a desk and understand that, as a donor, you helped give another child this same opportunity. And as we have discussed before, success stories like these serve as proof that you are an effective organization making a difference. Thanking donors is a crucial part of every fundraising campaign and a huge opportunity to bind donors to your cause. Therefore, giving thanks on Instagram or any other social platform should become a best practice nonprofits integrate into every fundraising campaign. To date, the FEED Foundation has provided nearly 84 million meals through the sale of their good products. This fall FEED tried something new and for the first time they launched a collective initiative to move the needle on fundraising — the inaugural FEED Supper. Over 30 days, supporters hosted FEED dinner parties to raise money towards the shared goal of providing 1 million meals to children and families around the world. When first launching a social campaign, I often find that people stress too much about promoting content and engagement across all of their channels rather than focusing on one. Right off the bat, FEED was incredibly clear about where they wanted supporters to share updates and personal FEED Supper photos. And if you have ever spent more than five minutes on Instagram, you may understand why Instagram was FEED’s platform of choice — People LOVE sharing photographs of Food! 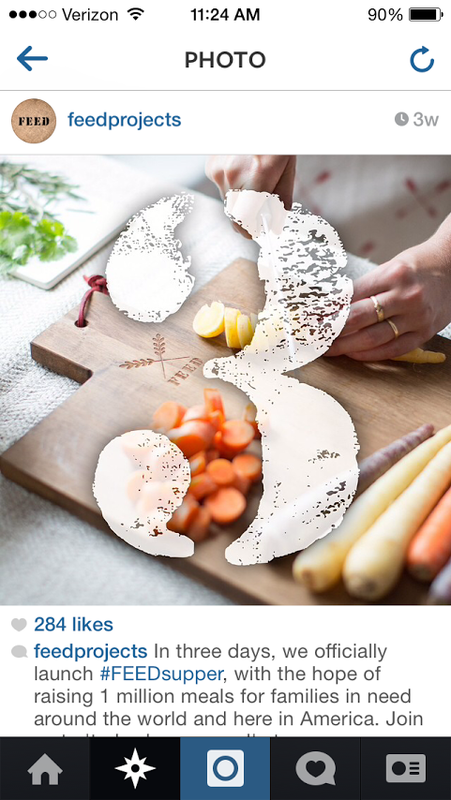 Foodie pictures are almost as popular as #selfies these days. 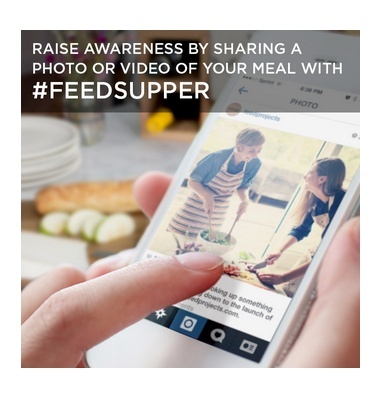 Since this was the inaugural year for the FEED Supper Initiative, it was important that FEED provided step by step instructions on how to host a FEED Supper. Included in these instructions, was an image calling out how hosts were to share any photos or videos. Although an incredibly simple concept, this graphic of someone in the “Insta” act was the perfect way to reinforce that Instagram was the primary channel FEED was using to support the campaign. 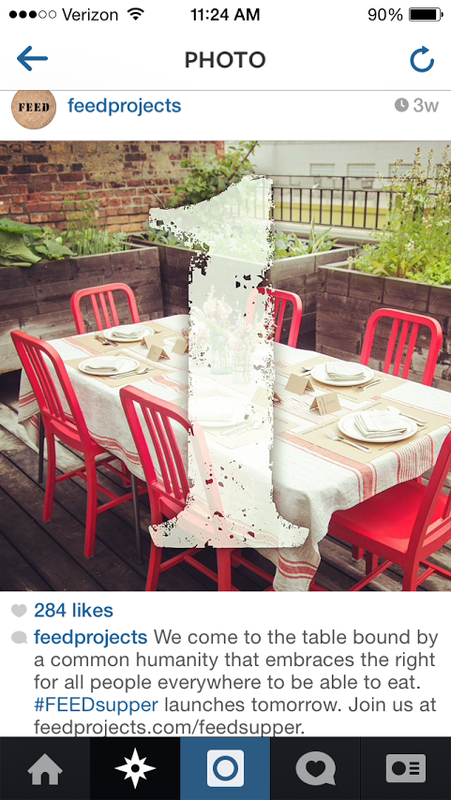 To promote the kick-off of the campaign on September 16th, FEED started an Instagram count down. It was a great way to communicate with followers and a strong CTA to inspire people to host a Supper of their own. Countdown critics may call it redundant, but with all the social noise today, being repetitive can sometimes be effective. 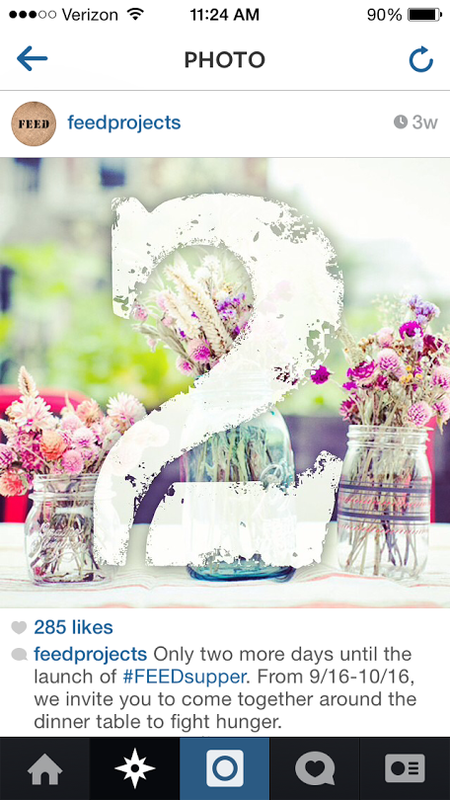 (Note, specifically, the countdown pairing with beautiful images you’d likely favorite and share on Instagram anyways)! Keep up the campaign momentum. 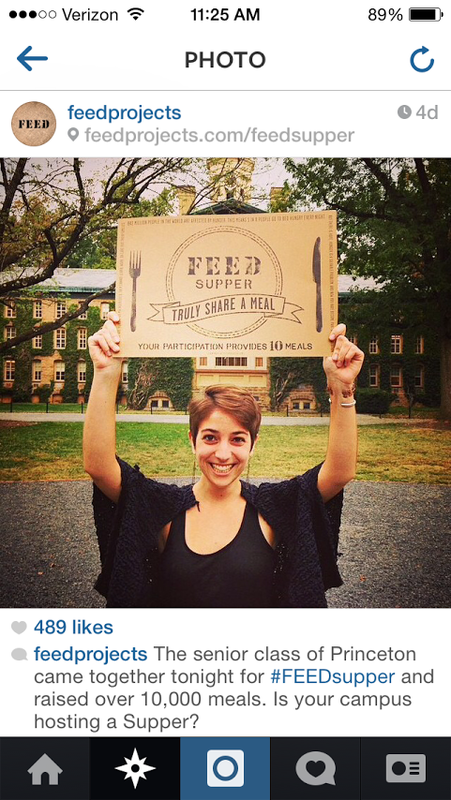 Like Pencils of Promise, FEED did a fantastic job of sharing their progress throughout the campaign. 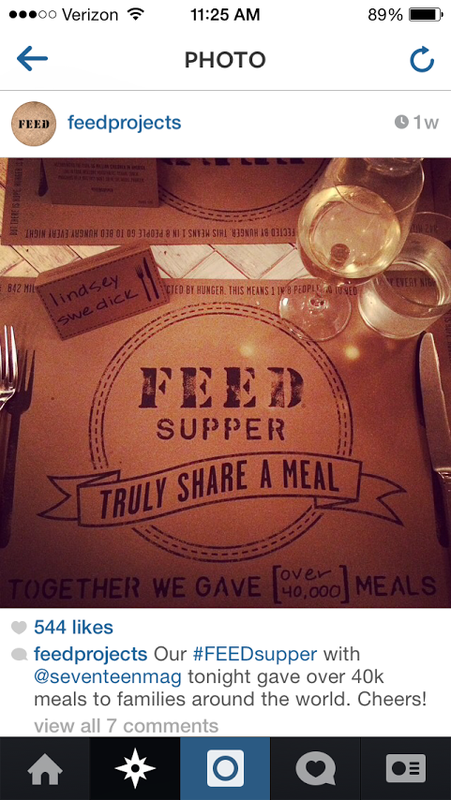 They shared updates of their own and photos posted from supporters who had hosted FEED Suppers. 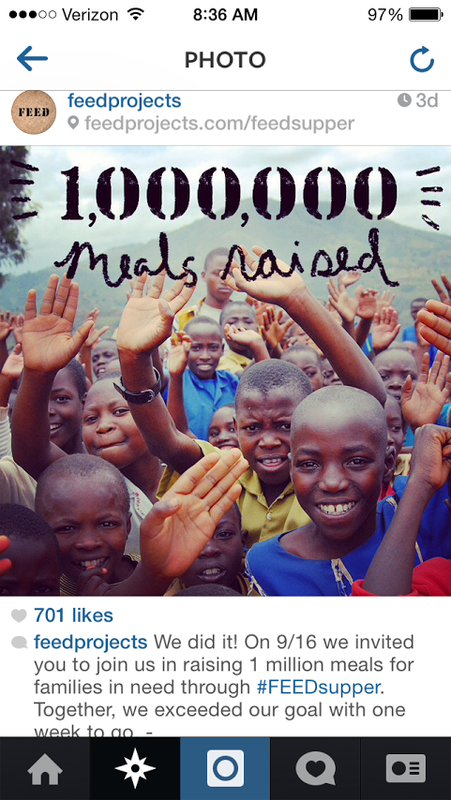 Here are a few photos from their Instagram feed, including one special update announcing that the campaign surpassed its 1 million meals goal. With this exciting milestone under their belt, they encouraged FEED supporters to rally and raise even more money. Keep a Breast is an incredibly timely example, given that October is National Breast Cancer Awareness month. Although the Foundation does a number of things to support those impacted by breast cancer, October is all about turning awareness into action. 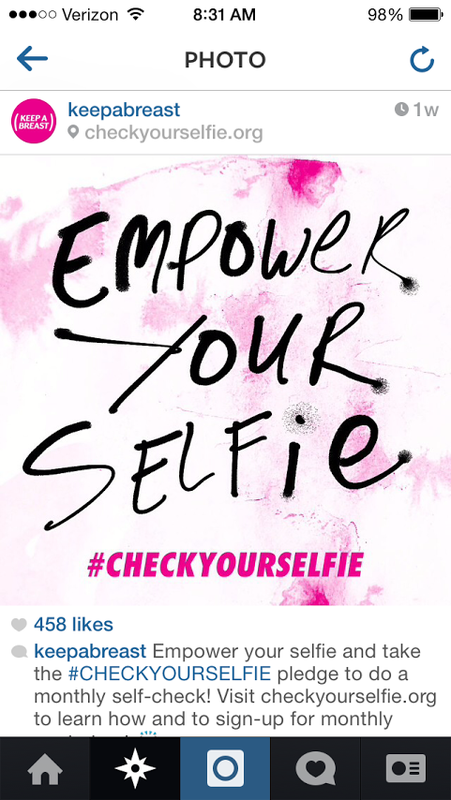 Keep a Breast’s, #CheckYourSelfie Campaign, is a social movement that challenges young people to take the pledge and commit to performing monthly-self checks, while spreading the word about the importance of early detection services. 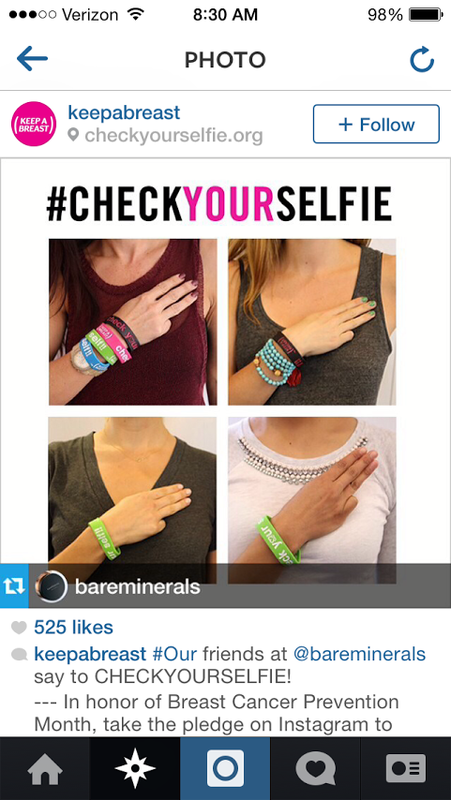 The #CheckYourSelfie campaign has taken off in part because Keep a Breast knows where and how to engage its audience. Because Instagram is heavily used by young adults, it makes sense that a campaign targeted at Millennials would thrive on the platform. The campaign’s call to action, “Check Your Selfie,” is also perfect for the photo-sharing platform, where hundreds of selfies are posted every day. Ask supporters to leverage their social networks. After posting a selfie, participants are instructed to tag three friends and challenge them to take the same pledge. As we have seen from other social campaigns like the #IceBucketChallenge, the act of tagging friends and “nominating” them to participate is quite effective. It can exponentially increase the reach of a campaign and it makes people more willing to participate when they see their family and friends have too. Make it easy for people to learn how to get involved by using strong CTAs and including your campaign/donation page URL in your captions, profile and comments!